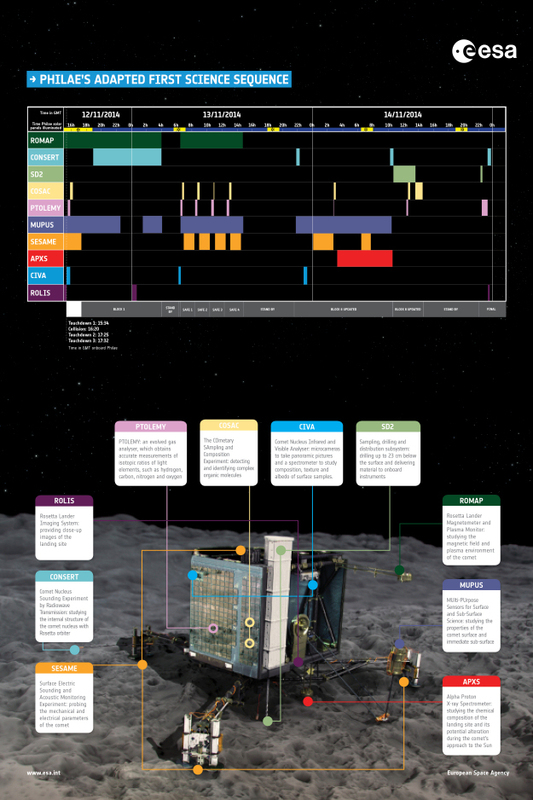 A timeline of the science operations that Rosetta's lander Philae performed between 12 and 15 November 2014, following touchdown on the surface of Comet 67P/Churyumov–Gerasimenko. This is an update on the original first science sequence. Following Philae's unexpected flight across the surface of the comet, the planned first science sequence had to be adapted according to the new situation. The graphic shows the approximate times (to the nearest 15 minutes) that each of Philae's 10 instruments was activated; however, it does not indicate the success of data acquired.